Advanced Fantasy Baseball: Fantasy Baseball Investments: Safe or Dangerous? As fantasy owners we are constantly searching for an edge. Something that will allow us to know a little more and draft a little better than our rivals. It is not easy these days. Everyone has access to great information. One of the little tapped areas (and we have seen more articles about it than ever this year) is in drafting those that hard fluke bad seasons, obviously expecting a rebound. Another area would be avoiding those that had fluke good seasons. I've put together a list of some of the most surprising performers of the 2011 season (both good and bad) and given you my views on what led to the performance and how likely it is to last. To make things simpler to understand for those that tend to scan articles quickly without reading, Ive labeled the players I believe will be solid contributors as Safe and those unlikely to be as Dangerous.These aren't in any special order. Last season I predicted that Adam Dunn would hit 50 homers. There wasn't much evidence to suggest that he couldn't. he was moving into a more favorable park and into what seemed to be a better lineup. However, there was some evidence that a down year was coming, it stands out a bit more now. The last two seasons Dunn has swung at many more pitches out of the zone than he did in previous years. He has never been a good contact hitter on such pitches and it led to a two year spike in his strikeout rate. He also had an appendectomy just before the season started and came back to play very quickly. It seemed to me at the time, and my belief in this has only gotten stronger, that this led to some reduced power. He also hit a lot more infield fly balls than he typically does. This is usually a sign that a batter's timing is off. It could also be a sign that his bat is slowing down. His .240 BABIP relative to his career .292 rate will probably rebound some. But if his bat is truly slowing it is not likely to come back all the way. My belief is that Dunn's power is not entirely gone. I do believe that his bat is slowing down and as a consequence his power will not come all the way back. If he gets a full workload I can see him hitting 20-25 homers but i think the average will be closer to .200 than the .250 average we've always been willing to accept for 40 homeruns. I am avoiding Dunn unless I get a very extreme discount. Mike Morse has been a pretty good hitter for a while. He has shown little patience but is a decent contact hitter for a slugger. He had a slightly elevated line drive rate in 2011 which probably contributed to his high average and slightly elevated slugging percentage. But the thing that most contributed to his great season was a high number of at-bats. Morse should see even more plate appearances this season as the full-time starter in left field from the start of the season. This should allow him to come fairly close to repeating his homerun totals from 2011. However, there should be some regression to his career BABIP and batted ball rates. But I think this is more likely to reduce his average than dramatically reduce his power. I see a .275-280 hitter with 30 homerun power. I am definitely buying. It is kinda weird, but some of the problems Rios had in 2011 were probably due to him making too much contact, thus putting more balls in play. He swung at more pitches out of the strike zone than he usually does, but he also made much better contact with those balls, unfortunately he could not do anything with them. That combined with poor BABIP luck and a slightly lower HR/FB relative to his career rates, suggests that this was just more of the tragically bad luck that struck the White Sox last season. He should rebound but still bid cautiously. Rios has been very bad two of the last three seasons. I'm staying away. The funny thing about Hellickson is that most analysts expected him to be good. Hell Boy had great numbers in the minors and the Tampa Bay Rays are very good at extracting the most from their young pitchers. In the minors he displayed a strong k-rate and excellent control to go with a decent trend of inducing groundballs. He was one of the better pitching prospects in the game. However, his performance in 2011 as a major leaguer did not much reflect those skills, despite his excellent results. He had an extremely low BABIP of .223 and a rather weak 5.57 K9. At the same time his walk rate was higher than it ever was in the minors at a mediocre 3.43 BB9. All this led to a FIP of 4.44 and a xFIP of 4.72, numbers you would not like to see as ERAs on your fantasy roster. Not all is lost is lost for Hellickson owners. He has a very strong history as a pitcher. I full expect that his control and strikeout rate will rebound. Owners need to be aware that even if his skills show a massive improvement he is still unlikely to repeat his 2011 results. That leaves plenty of room for him to be good however. I am not buying but if I owned him at a decent price I would still hold him. I do not think he will turn into a disaster for his owners, but he will be disappointing relative to his 2011 results. Vogelsong was a pretty bad pitcher for the Pittsburgh Pirates early in his career. He ended up in Japan where he apparently learned enough about pitching to sign on with first the Los Angeles Angels and Philadelphia Phillies and finally the Giants as a minor leaguer. His problem has always been horrid control. Until 2011 that is. Last season Vogelsong had pretty good control. It was not there in 2010 in the minors. Even his short stint in the minors during the 2011 season he didn't show amazing control, but it was still improved from previous seasons. His BABIP was low but not so low to suggest that there was no talent involved. It is difficult to believe in a repeat of his 2011 results but I do believe that he has made enough real improvements to be a solid average pitcher providing innings at the end of the Giants rotation. There is little doubt that A-Rod is getting older and closer to the end of his career than to his prime. However he has still been very effective when he has been healthy. The problem is his injuries have been more frequent and longer lasting than in the past. I suppose some will point to his past PED use as a factor but I do not actually believe that to be the case. Rodriguez began the off-season by having a procedure done on his knee on NBA star, Kobe Bryant's recommendation. Bryant vouched for the German doctor who developed the course of injections of plasma-rich platelets called Orthokine that supposedly stimulates healing in arthritis-affected areas. A month after the knee treatment Rodriguez had a 45-minute conversation without another NBA star, Grant Hill. Hill was able to answer questions A-Rod had about signing on for Dr. Mike Clark's Athletic Performance Optimization System. Hill credits Clark with extending his career after being close to retirement due to consistent injuries. An almost instant convert, Rodriguez invited Clark to his Miami home. The toes-to-neck assessment, which included a breakdown of Rodriguez’s swing, left Clark believing A-Rod had strength imbalances and/or a lack of flexibility in his right big toe, left ankle, right knee and right hip. It is a chicken-and-egg argument what came first, but all feed upon each other to create a domino effect of wear, tear and pain. They also helped cause, in Clark’s estimation, an impingement in Rodriguez’s left shoulder. A result of the lack of movement here and instability there was a swing that had lost some range and power. You might want to dismiss the idea of inflexibility in a toe as being consequential. But Clark doesn’t, believing “in a ground up” evaluation. Rodriguez had a 27-degree range of motion in his right big toe, when 70 is ideal. Without that flexibility, when the toe grounds into the dirt just past the midpoint of a swing, greater stress is placed on, among other things, the knee and hips — the two areas where Rodriguez has had surgery over the past three years. I am buying on A-Rod's rebound this year. Fister was drafted by the New York Yankees in the sixth round of the 2005 draft. he held out for more money and it did not pay off. He wound up the seventh round pick of the Mariners the following season. His performance in the minors was okay but not spectacular. He always displayed solid control and mediocre strikeout rates. More recently his control improved and his k-rate slightly improved. Still little was expected of him. He had a solid debut in the majors in 2009 and displayed more of the same in 2010. However in 2011 his velocity spiked and he showed the best k-rate of his career. This led to great success but even with the slight improvement to his skills there are reasons to wary of his ability to repeat. He had an extremely low BABIP and HR/FB. He is moving from Seattle's Safeco Field which has a 95/82 L/R HR factor to Detroit's Comerica Park which has a 88/108 factor. He will also have a much weaker defense behind him for the entire season. With less luck, less favorable park, and a less favorable defense, Fister's BABIP is very likely to go up a significant amount. Fister may still be a solid starter but do not expect an ace or even more than a solid mid-rotation innings eater. If you want a sleeper in Detroit's rotation take a look at Max Scherzer. I am not buying on Doug Fister. Most of Ubaldo's core statistics have been relatively consistent over the last four seasons. His strikeout rate, walk rate, and groundball rates have been pretty much in a consistent range. What first stands out from the 2011 season is his BABIP of .317 relative to his career .286 mark. Then his HR9 and HR/FB are both elevated. 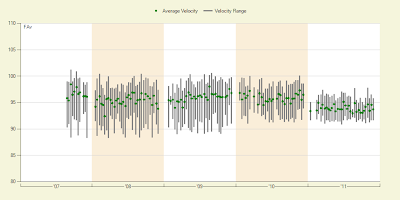 taking a look at his PitchFX charts makes the cause seem pretty obvious - reduced velocity. You can see it for yourself in the chart below. After spending most of his career throwing in the mid to high 90's, Ubaldo was suddenly in the lower 90's. It may not seem like a tremendous change but to major league sluggers it was. He mostly fought through two injuries last season. A thumbnail injury and a groin injury. "Ubaldo felt that his season was sidetracked by a groin injury that affected his lower-body strength and his ability to consistently execute his delivery. To be sure he comes into camp with the best foundation for success, Ubaldo has worked diligently this winter with one of our strength and conditioning coaches on his core and lower half strength and flexibility." In fact one of the Indians Strength and Conditioning coaches, Nelson Perez, moved to the Dominican Republic over the winter so that he could work with Jimenez and catcher Carlos Santana every day. It seems to have worked because so far this Spring Training, Jimenez had his fastball back to a consistent 94-96 mph. I'm buying.